Register for Aid Sudan 5K! 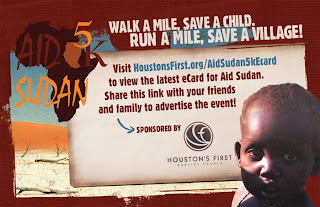 Houston's First Baptist Church is sponosoring the Aid Sudan 5K (walk or run) and Kids 1K on Sunday, April 25th. Check out the details here and then register here. This is such a great event-- all proceeds go to support Aid Sudan, and it's a great opportunity to show off your running skills or leisurely walk with friends ands family.